GoPlans is a comprehensive web-based lesson plan management solution. Lesson plans can be customized for your needs and are designed to work in either collaborative, individual configurations or both combined. Customized resources are embedded into GoPlans and are easily accessible for teachers as lesson plans are created. Learning standards, and curriculum guides are available to use during the lesson plan creation process. We facilitate the configuration of all lesson plan templates according to your preferences and recommend adjustments as needed. 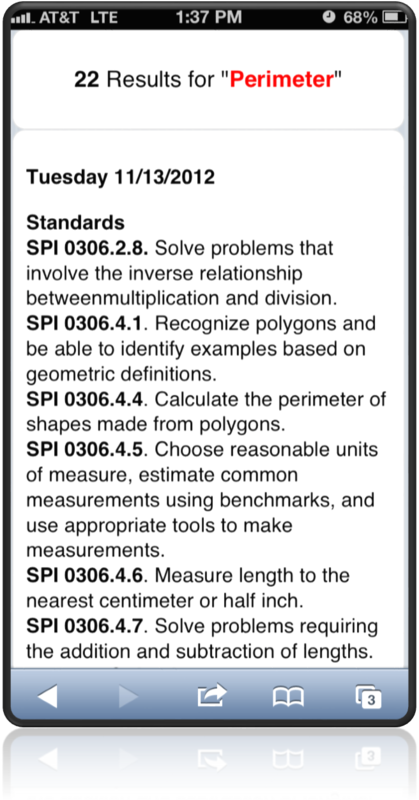 The lesson plan service includes a zero configuration implementation. We handle hosting, setup, and user management. It all starts with the plan manager. Teachers access and plan for any week of the year using simple drop-down menus. Multiple teachers can enter information into the same plan when configured as a collaborative lesson plan. This takes the management out of sharing lesson plans between educators. Lesson plans are secured right down to the individual teacher. Schools control who gets to add or edit specific lesson plans. Plan boxes are available for teachers to add and save lesson plan content directly in a web browser. The WYSIWYG editor makes it easy to add formatting to each lesson. Save buttons are located above and below the lesson plan boxes. GoPlans allows for the design and alignment of lesson plans to existing templates in a district or school. Access to historical data allow teachers to reuse and modify lesson plans from a different school year while authoring new weekly plans. Save time for your teachers by pre-populating each plan with recurring text such as template headers. 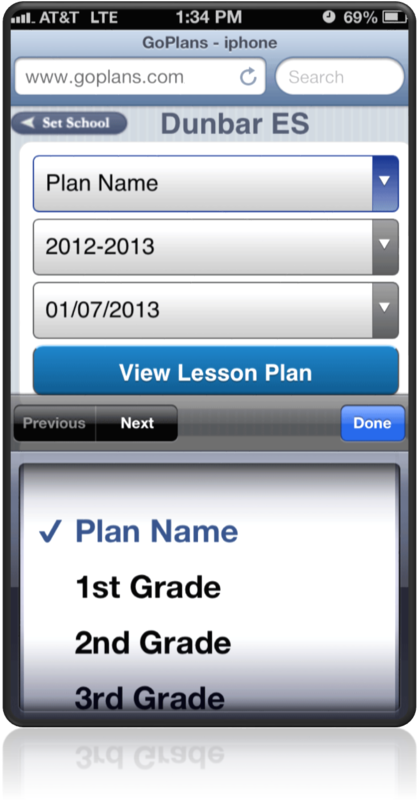 Each plan can be customized individually so every teacher can get an aligned lesson plan template. Pinpoint instruction using the built in search tool. Everything in a lesson plan is data and is searchable in GoPlans. If your classroom is struggling with a concept simply perform a search in your lesson plan to review when you taught a skill aligned to the concept. In an instant you will see the results in real-time. Align interim test results to what was covered in your lessons plans. The correlation of student test results and the frequency of taught skills is a game changer. View the results of a search on a timeline to understand the relationship between time and what is taught. The white markers represent the day a lesson is taught based on the search term. The "A" represents when the state test is administered. Search results can be beneficial to teachers, testing coordinators, curriculum staff, facilitators, learning coaches, and principals. Lesson plans are data. They should be used in the same way and are equally as important as other analyzed data sets (assessment, attendance, behavior, teacher observation, demographics, grades, interventions, etc.). Extend your search to analyze lesson plans over time. 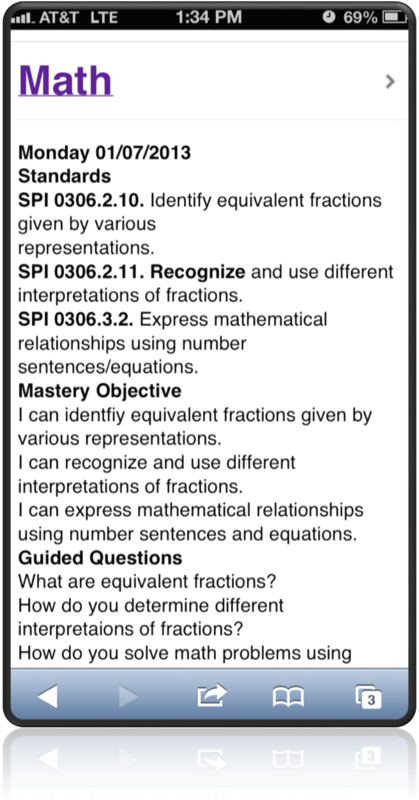 This example shows "compare and contrast" was covered in 68 lesson plans during the 16-17 school year compared to 31 in 15-16. An increase of 37 days of instruction on this skill is observed. Save time adding / tagging lesson with standards. Simply drag and drop any standard into your plan and it is automatically associated to the lesson plan content. Searching for lessons associated to a particular standard can be performed instantly without tallying or counting through lesson plans. Instantly locate standards by typing a few keywords into a search box. Standards update as you type. Find the standards you need for your lesson and drag/drop them into your lesson plan. Add district resources directly into GoPlans for quick teacher access. Ensure teachers have all of the necessary curriculum maps, pacing guides, and district resources in one place (as they create plans). Add school resources into GoPlans too. Each school can embed their own resources such as schedules, calendars, or other resources. Link to internal or external resources to instantly provide access to all teachers. Add individual teacher resources directly into GoPlans for quick access. Teachers can save web resources for access when creating a lesson plan. Print plans directly from GoPlans. Our system generates a PDF document that can be printed, saved, or emailed. Each plan is configured to control the number of subjects/columns per page and the number of total subjects in a lesson plan. Change the way you collect and monitor lesson plans in your district or school. Monitor lesson plans from a cell phone or tablet device. Any smart phone or tablet device can access lesson plans, search lesson plans, and provide feedback directly from GoPlans. In the process, save paper and time accessing teacher lesson plans. Integrate data analytics into your lesson plan data to locate and understand how content was used in your school building or district. Heat maps are used to pinpoint content in real-time. 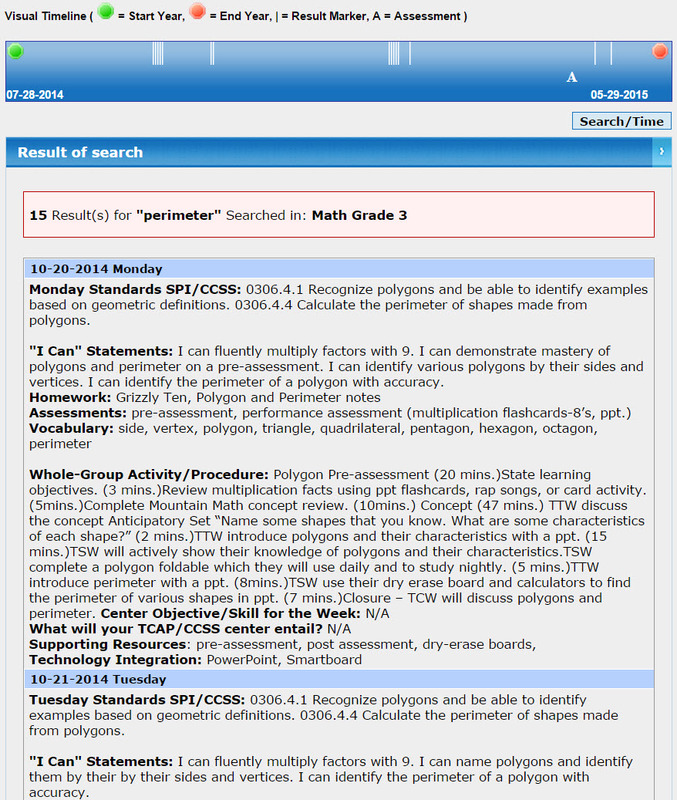 Example shows a site-wide query for "Blended Learning" in all "Math" subjects. Results show how the term "Blended Learning" was used/integrated into the daily plans for a school year. The data suggests blended learning wasn't fully integrated into the school year until October and grade 5 excluded planning for the strategy from daily plans after January. GoPlans™ is sold as a yearly subscription. Prices vary depending on the number of users. Please contact us to request a demo. We handle the hosting of GoPlans. We provide end-to-end software management including professional development. All of our applications are created in collaboration with teachers. A good teacher application is built with practicing educators. In other words, we do not think up ideas and start writing code. Instead, we discuss classroom inefficiencies with teachers and work to solve them - all before any code is written. We use high powered, fully redundant, managed servers from Rackspace™. We benefit from a guaranteed zero-downtime network. We use the best hosting company in the business.